It’s very difficult to imagine what English painter John William Godward looks like. There are no surviving pictures of him, as his family, who disapproved of him being an artist and his subsequent suicide at the age of 61 as well as other earlier indiscretions, prompted his family to burn all his papers. Their shame knew no bounds. But the enduring works of this Neo-Classicist, who had a consistent career for over 40 years, remain as interesting today as they were in the 19th and 20th centuries. 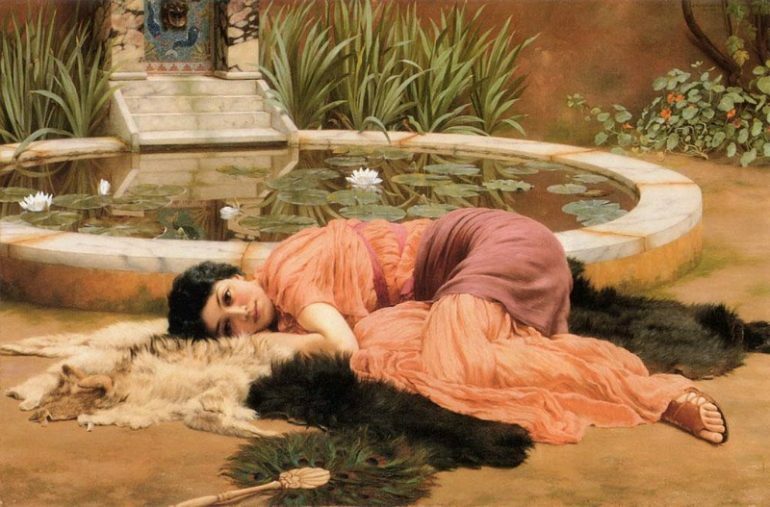 John William Godward was born on August 9, 1861 to very overbearing parents. He lived at Wilton Grove, Wimbledon where his father was an investment clerk at the Law Life Assurance Society of London. Due to his parents’ attitude, the young John Godward, who was named after his father grew up shy and reclusive. Godward was known for his penchant for classical genre scenes that were reminiscent of Ancient Greece. He painted in watercolor and oil, showing beautiful maidens in classical robes, all done in great detail. He was a disciple of Sir Lawrence Alma-Tadema and became known as the master painter of classical tunic gowns. His excelled in painting diaphanous fabrics softly and gently flowing over a model’s figure, accented by archeologically-exact depictions of marble surfaces. Godward virtually created his own niche of classical painting style during his time. It was the emergence of new painters such as Picasso, which led to his style of painting falling out of favor from patrons that led to his suicide. Eugène Cremetti created a wider audience for Godward’s works. He also joined the Paris Salon in 1899 and won a gold medal at the International Exhibition in Rome in 1913. At the beginning of the 20th century when the British Empire’s prosperity rose, the interest in classicism was revived, which increased the success and popularity of Godward. The year 1910 was one of the best years for the artist. He was so in love with the Greco-Roman era that he filled his art studio with various antique objects, reproductions of ancient statues and different kinds of marble to recreate an ideal environment of classical inspiration. 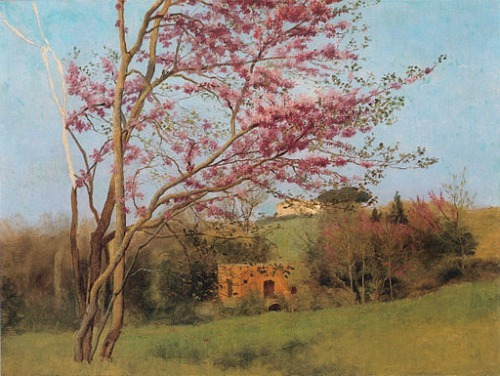 His love for the classics was further boosted when he took a trip to southern Italy in 1911 and decided to stay in Rome until 1921. Dolce far Niente (Sweet Nothings), which was painted in 1904, was one of Godward’s best known paintings. It was purchased in 1995 for the Andrew Lloyd Webber collection. It showed a beautiful woman resting on various animal skins near a shallow circular lily pond enclosed in marble. A major number of Godward’s works showcased women in classical dresses. They were posed against static landscapes. In his canvases, he displayed his sensitivity and mastery of rendering contrasting textures, from the softness and delicacy of human flesh, to the coolness of marble and the flowing folds of soft, thick and diaphanous fabrics to the different textures of animal fur. Although he received no critical acclaim and was often labelled as an Alma-Tedema clone, John William Godward was the best among the last batch of great artists from Europe who still embraced the classic beauty of Greco-Roman art.